Supporting the maintenance and successful operation of aircraft and the service and security of passengers and airport visitors, Panasonic’s aviation technology delivers solutions that ensure greater safety, customer convenience and business efficiency than ever before. How do Panasonic solutions support aviation? 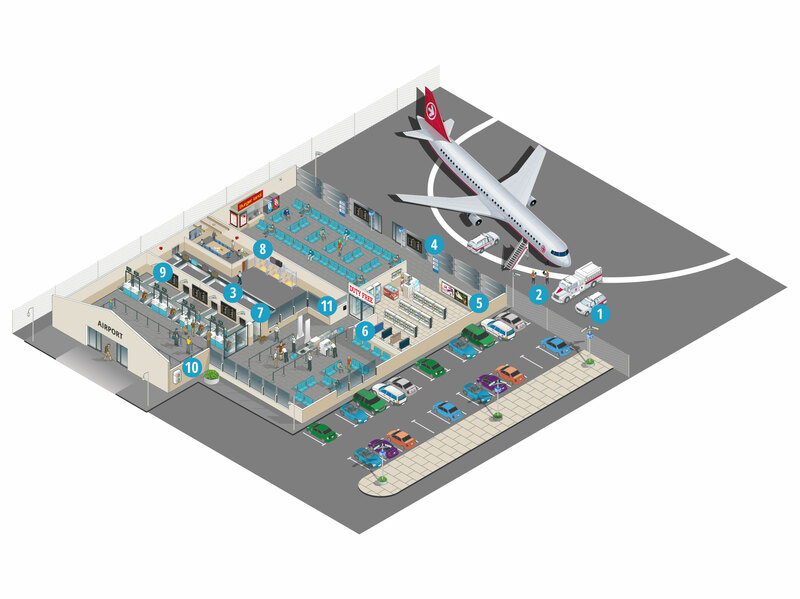 Flexible, smart communication systems are crucial for airports, train/bus stations and logistics centres. Panasonic’s visual solutions such as displays, Video walls or projectors are the ideal way to share ideas or plans visually in collabroative sessions, or create engaging, captivating and persuasive messaging to visitors and passengers at airports and stations – indoors or outdoors. Able to be managed remotely, in real time through easy-to-use tools, they provide the perfect support to every transport setting. Turnaround times are critical to the logistics, aviation and rail industries. Standing aircraft, trains or trucks mean lost revenue. But with a Toughbook or Toughpad tablet, sign-offs, checks and approvals can be carried out in an instant, thanks to their ability to perform at the point of service, their easy-to-use form factors and consolidated functionality.